The prevalence of external auditory canal (EAC) carcinoma is between 1 and 6 people per 1 million population. It accounts for <0.2% of all head and neck cancers., The incidence is higher, i.e., 1 in 5000–15000 cases among the patients presenting with otological diseases. Although several cases of cancer of EAC or temporal bone have been reported previously, most of these are limited to squamous cell carcinoma (SCC). Chronic inflammations of EAC and middle ear, chronic suppurative otitis media, radiotherapy, chlorinated disinfectants, and some toxic agents such as Thio-TEPA are the possible risk factors for EAC carcinoma. Early symptoms include otorrhea, otalgia, and conductive hearing loss (CHL). The tumor destroys adjacent bone in the EAC and middle ear and invades the surrounding soft tissue. Extension into middle cranial fossa, mastoid, and soft-tissue beneath the temporal bone is common. Temporomandibular joint, parotid gland, and carotid canal may be involved in EAC carcinoma. Here, we reported a case of metachronous bilateral EAC carcinoma in a 33-year-old male. A 33-year-old male presented with a complaint of discharge from the left ear for 2 years. The discharge turned to be blood stained for 4 months and associated with otalgia and tinnitus for 3 and 2 months, respectively, without any hearing loss or giddiness. 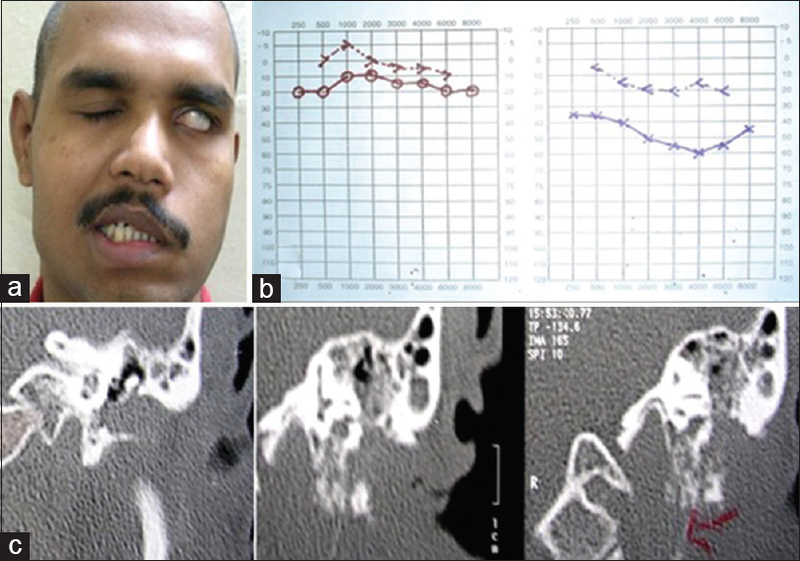 He developed sudden onset left facial nerve palsy for 1 month [Figure 1]a. On examination of ear under microscope, there was polyp completely filling the EAC, tympanic membrane was not visible, and right ear was normal. On clinical examination, there was House-Brackmann Grade IV facial nerve paralysis of the left side face and no neck node enlargement. The tuning fork test showed rinne negative in left ear and weber lateralized to the left ear. Pure tone audiometry showed a mild to moderate CHL in left ear and right ear hearing threshold within normal limit [Figure 1]b. High resolution CT scan of the temporal bone showed a soft tissue mass in the EAC with erosion of the anterior canal wall, extension into the mesotympanum, the erosion of lenticular process of incus and stapes extension into epitympanum, mastoid antrum, and involvement of styloid process [Figure 1]c. Biopsy from the polyp was taken, and the histopathological examination revealed features of well-differentiated SCC [Figure 2]a.
Subtotal petrosectomy with superficial parotidectomy sacrificing facial nerve was performed as the facial nerve was exposed near the second genu because of tumor involvement. Ipsilateral supraomohyoid lymph node dissection was done. The anteriorly based temporalis muscle and posteriorly based sternocleidomastoid muscle flap were used to close the defect. Microscopic examination revealed that all the cut margins were free of tumor with metastatic lymph node. Cul-de-sac closure was done. The patient received adjuvant radiotherapy of 60GY in 30 fractions to the left face and upper neck through intensity-modulated radiotherapy technique. After treatment, scar mark was highlighted in [Figure 2]b. The patient was doing well without any disease for 3 years of completion of treatment. After 3 years of follow-up, he developed recurrent right ear discharge with blood stained and decreased hearing without tinnitus, giddiness, or pain. On examination of ear under microscopy, there was a polyp in the right EAC, tympanic membrane was not visible. There was no neck node. Biopsy of EAC polyp was taken, and the microscopic examination revealed the features of poorly differentiated invasive nonkeratinizing SCC. High-resolution CT of the temporal bone showed soft tissue opacification in EAC with no bony erosion. The ossicular chain was intact with inner ear structures appearing normal [Figure 3]a. Right lateral temporal bone excision with tympanoplasty Type III and meatoconchoplasty along with ipsilateral supraomohyoid lymph node dissection was performed. Microscopic examination of the operated specimen showed no perinodal or lymphovascular extension, all the cut margins were free of tumor with no lymph node metastasis. The patient did not receive adjuvant radiotherapy due to lack of any risk factor. Postoperatively, the patient developed good hearing improvement [Figure 3]b. The patient is on regular follow-up since 18 months of the last treatment without any disease. SCC of the EAC is a rare entity and bilateralism is rarer. The median age at presentation is in the seventh decade. It can develop in younger adults, and the possibility should not be ignored merely on the basis of age. Otorrhea with or without blood stained and otalgia are the most common symptoms. Due to the possible coexistence of SCC of EAC with external otitis and chronic suppurative otitis media, delayed diagnosis is common. Our patient had a history of chronic otitis media resulting delayed diagnosis. The proximity of facial nerve makes it most at risk and patients often present with facial weakness as in our case. If a case of otitis media or otitis externa does not responding to standard therapy, the biopsy should be done for pathological diagnosis if carcinoma is suspected. CECT and magnetic resonance scans provide an accurate preoperative assessment of the extent of disease with particular regard to bone erosion and soft-tissue involvement. Survival is partly related to the stage at presentation. The most widely used staging system is the University of Pittsburgh staging system. The optimal therapeutic procedure is unclear due to the rarity of the disease. Complete surgical resection with or without radiotherapy is the standard treatment. An aggressive primary surgical treatment should be done even in an early stage tumor to ensure a negative margin. The most favorable survival rates are achieved with en bloc extended temporal bone resection and postoperative radiotherapy. The extent and type of surgery range from mastoidectomy to total petrosectomy. Parotidectomy is a routine component of surgical management. Appropriate lymph node resection is necessary to prevent regional metastases. In the present case, left-sided carcinoma was treated by surgery followed by radiotherapy and right-sided carcinoma was treated by surgery. Free flaps are extremely reliable in achieving successful reconstruction of the head and neck. In our case, we utilize pedicle muscle flaps for closer of the defect on both sides, and we took split-thickness skin graft for proper epithelization of the cavity in the right ear. Early diagnosis and aggressive treatment are essential in the management of these tumors. Audiometry should be performed in every patient, and suitable steps should be taken to minimize the hearing disability that will inevitably arise during the treatment. Elsürer C, Senkal HA, Zayyan E, Yilmaz T, Kaya S. Bilateral external auditory canal squamous cell carcinoma: A case report. Eur Arch Otorhinolaryngol 2007;264:941-5. Morris LG, Mehra S, Shah JP, Bilsky MH, Selesnick SH, Kraus DH, et al. Predictors of survival and recurrence after temporal bone resection for cancer. Head Neck 2012;34:1231-9. Zhang T, Dai C, Wang Z. The misdiagnosis of external auditory canal carcinoma. Eur Arch Otorhinolaryngol 2013;270:1607-13. Zhen S, Fu T, Qi J. Diagnosis and treatment of carcinoma in external auditory canal. J Otol 2014;9:146-50. Nyrop M, Grøntved A. Cancer of the external auditory canal. Arch Otolaryngol Head Neck Surg 2002;128:834-7. Gidley PW, Roberts DB, Sturgis EM. Squamous cell carcinoma of the temporal bone. Laryngoscope 2010;120:1144-51. Bacciu A, Clemente IA, Piccirillo E, Ferrari S, Sanna M. Guidelines for treating temporal bone carcinoma based on long-term outcomes. Otol Neurotol 2013;34:898-907. Masterson L, Rouhani M, Donnelly NP, Tysome JR, Patel P, Jefferies SJ, et al. Squamous cell carcinoma of the temporal bone: Clinical outcomes from radical surgery and postoperative radiotherapy. Otol Neurotol 2014;35:501-8.